He is a dog with plenty of devotion and love to give. 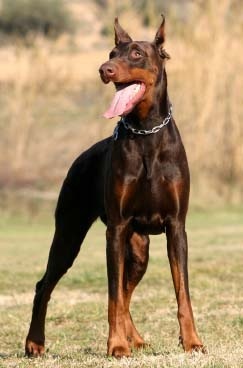 Doberman Pinscher were created by Louis Dobermann of Apolda, originates from Germany during the 1860s. These breed takes its name from the man that developed it, Louis Dobermann, and the German word “pinscher” means terrier. He bred as a companion dog and yet still serve as a guard dog. This breeds of dogs was registered with the AKC in 1908. Doberman is a medium-size dog with a compact, balanced build body. He has a very short, ruthless and very dense hard coat, close to the skin surface. Usually in the chest area, neck, the limbs and tail will be a light-colored spots on the inside. Coat colors comes with black, brown and blue. The Doberman character are bold, sensitive, determined, and good biting. This breed is elegant, resourceful, courageous, and highly intelligent. He is a natural guard dog, graceful and highly offensive. The Doberman Pinscher is easy to train. The socialization training and obedience should start from a puppyhood is important, including the household rules and social manners. The training should be consistency, firmness, fairness and with patience. The breed thrives on canine sports. Grooming the Doberman short coat is easy, it's need to brush it with a soft bristle brush or curry comb twice a week. It is also important to keep their nails trimmed short. During the spring and fall, when shedding is at its worst, daily brushing will help keep hair in the house to a minimum. This breed is an average shedder. Doberman Pinscher is very suitable for city life, heat cold, short hair, and do not always sort out, easy to train, but they are not easy to get along with the others dogs. Health concern include hip dysplasia, heart problems, cardiomyopathy may also occur.